A particular clothing store that I really miss here is Dangerfield. It was my favourite place to shop in Australia and luckily they have an online store that ships internationally. They have the perfect mixture of vintage inspired, sometimes slightly quirky and grungy pieces that I feel perfectly embodies my style so definitely check them out if you might be interested. Don't forget to follow this blog via Bloglovin' to stay updated with my posts as Google Friend Connect is closing down on July 1st. Gah i'm loving your hair! And your shoes! Buckles are always a winner. Love this outfit! 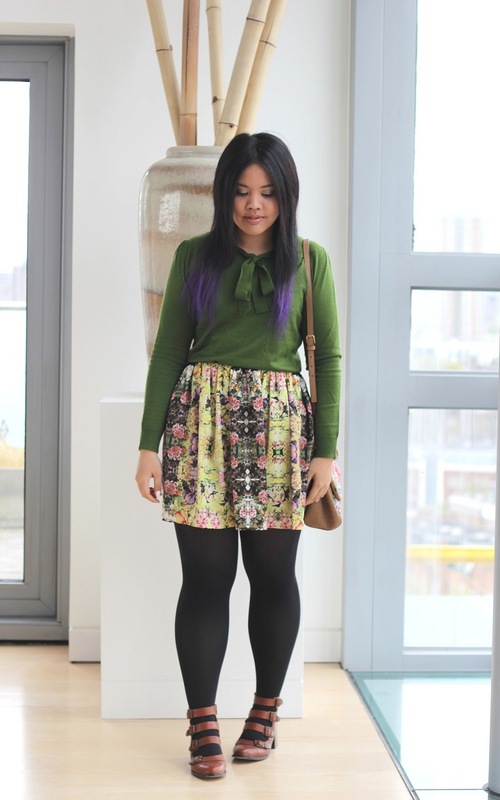 the green top goes so well with your skirt! your boots are awesome and i love your hair. sooooo damn pretty. i might dye my ombré pastel pink but i'm not quite sure. Love this outfit on you!! The skirt and top look like they were made for each other! great look and your hair looks amazing!!! That green jumper is sooo pretty!!! x A.
wow that purse is amazing!